The last Deco(c)rate shipped out a few days ago. I did not buy it this month, but I have subscribed a few times and will be sad to see it go, though it does seem like subscription boxes have a limited lifespan. I do have one item from the last crate to show you, however, namely the Vina Dining Set from the Plastik. While the theme for the crate was La Dolce Vita, I found that this rustic set of tables, benches and side table looked quite nice next to one of my medieval village houses from Fanatik. So, I opted for setting up a very rustic “garden party”, using some food props from Aisling. I have shown this gown before, though in another colour combination, but its one of my favourites among the newer releases from the Muses. I could have wished for a Slink Physique size, but for gowns Maitreya will often work well enough. This gown comes in two parts, bodice and skirt, and also includes Belleza Freya and Slink Hourglass sizes. 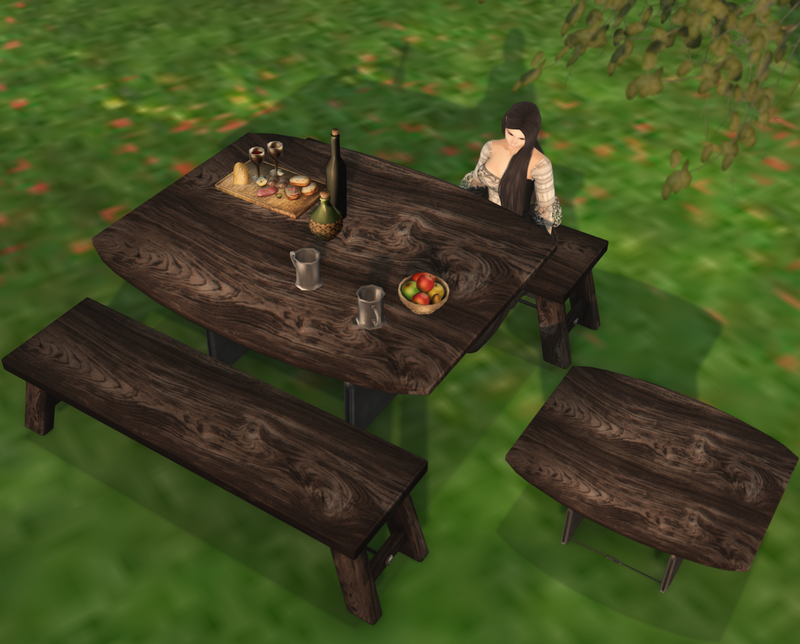 The Vina Dining set comes with a HUD that includes a large number of colour options and allows you to retexture benches and tables separately. The benches have a nice selection of animations, primarily for female avatars but there are some male sits included too.